It had been awhile since I was last at Tacos El Korita. This stretch of Olympic Blvd where the 5 and 710 freeways cross has always been hallowed taco land. Someone once called it the taco mecca. I don’t remember if I coined that term or not. During the day the mariscos trucks rule the boulevard, at night it’s the taco tables and some of LA’s best taco trucks. One of these trucks is Tacos El Korita, the only truck I know of that has a tortilla press in the truck that they use to press fresh homemade tortillas. There’s a King Taco that’s right by the freeway off ramp. From there the taco procession marches down Olympic all the way to Soto St with an occasional Cemita Poblano truck breaking the taco chain . On this night I noticed a truck with a florescent light advertising Tacos Arabes(this was after I filled up at El Pecas and El Korita). 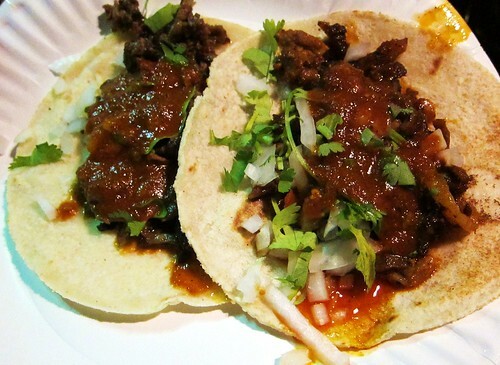 Tacos El Korita parks on Herbert St off East Olympic in front of La Potasina Meat Market. Patrons of El Korita use the La Potasina parking lot and there seems to be an agreement between El Korita and the meat market that El Korita won’t sell beverages. So after ordering from the truck patrons head over to the meat market and purchase their beverages. Orders are announced over a speaker system which is loud enough to hear even if your still inside the market deciding what to drink. I must admit, I don’t remember the tacos being this good. They were on fire this night. The tortilla so fresh, the meats just perfect. The al pastor is cut from the vertical spit and heavily seasoned. 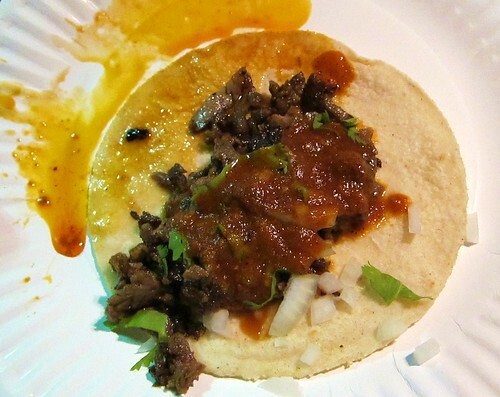 The juice from the carne asada soaks into the tortilla and the salsa roja, a lighter more flavorful version of King Taco‘s hot sauce brings both flavor and heat . If you want a more mild salsa El Korita has also perfected the King Taco salsa verde, a smoky blend of tomatillo, garlic and mild chile. I started the top 10 taco list as a way to keep track of the best taco trucks I have reviewed so far. It’s not a definitive list by any means and is curtailed more to my personal tastes than anything else. I can be easily swayed by a spicy salsa. If a taco makes my forehead sweat and makes me reach for that nearest bottle of Jarritos it has likely won me over. So I’m no taco expert. If I had to describe this blog I would say it is what someone who grew up on the Westside thinks about our cities tacos. Yes folks the top 10 taco list is a dictatorship. 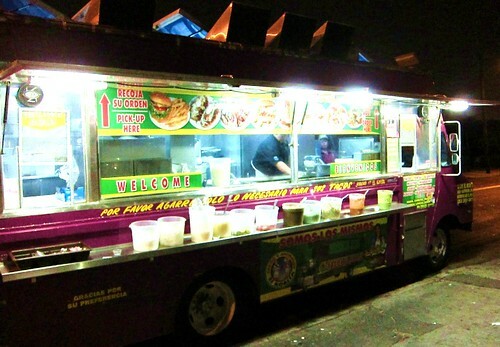 Think your favorite taco truck belongs? You’ll have to convince yours truly, the great taco despot of Los Angeles. Otherwise you could start your own top 10(OMG almost exactly the same as my top 10...I’m not that kind of dictator! You can have your own opinions!). Ahh well, imitation is the highest form of flattery.Where were we? Oh yeah! We have a new #1 taco truck! Tacos El Korita! My first trip was years ago and El Korita was impressive enough to land in the top 10 but now with this latest strong showing I can not deny El Korita their rightful spot at #1. 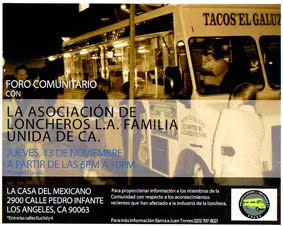 Yes my friends this is the best taco truck in LA! In my opinion! I've eaten at El Korita quite a few times and the tacos are ok as far as taco trucks go yeah they are pretty high up on the list. My money is on Sergios tacos in commerce for best tacos and salsa. Their menudo is great as well and they serve it everyday. hours are 6:00 until late...maybe 2am on the weekends. My favorite spot is on Slauson Blvd. as soon as you get of the 110 freway head east. My favorite spot is on Avalon and slauson, hand made tortillas and even an outside table to enjoy your food. for those who like other kinds of fast food there's a brand new Macdonald's on central and slauson. the only have "wraps"
is it Tacos Los Guichos? The Birria truck that used to park near Figueroa and Avenue 51 in Highland Park also makes their tortillas fresh inside the truck. I believe it's called El Pariente. Definitely worthwhile. Not the best, okay tacos at a higher price. Very disappointed with this place. I went here because of the votes on here. The tacos were extremely greasy and it seemed like they used low quality meat. I was so mad at the quality I almost stopped at King Taco up the street after I had some of these tacos. The only pro's here is that the tortillas are made by hand and their sauce is ok. Other than that, save your money!